Data recovery is a crucial and sensitive task. A computer could lose its data due to hardware fault, or some sort of system error. Plenty of data recovery software are available in the market to compensate for such loss, but not all of these software can effectively recover data from RAID segment. Even though the basic theories of RAID is pretty simple. RAID stands for Redundant Array of Inexpensive disks. Simultaneous storage of data in multiple disks is possible in RAID, thus the use of the word ‘redundant’ in the phrase. However, a RAID array can fail due to technical difficulties and as such disk arrays are used in collaborated storages as in office network or servers; such crash might bring several loss. Another case we discussed in the following article is how to recover photos from any storage media at the easiest possible way, be it from a RAID or a regular mount. Typically, two types of basic recovery operations are performed on RAID drives. A data recovery software like Data Recovery Wizard usually reconstructs the parameters of RAID in an array, and also subsequently recovering data stored in that disk. Recovery software that are sold in the market are mostly able to recover data from single hard drive failure on a RAID array, and if multiple drives tend to crash these programs might just sit helpless. Following cases stand more chance in data recovery using Data Recovery Wizard. Off-list cases might still stand out, but there’s no guarantee about that. In case of a normal deletion from a hard drive, even from the recycle bin. Since the deletion happened in a very natural way, recovery is possible. Accidentally formatted drive(s) in the RAID array could be recovered using Data Recovery Wizard, even if the operating system has been reinstalled. Repartitioned hard drive; partitioned in a mannered way etc. The method is plain and simple, launch EaseUS Data Recovery Wizard or Professional edition and select the drive you would like to run the recovery on. Select the types of files you prefer to be scanned for recovery such that Photos, Video, Document, Email, and Other etc. Upon clicking Next, EaseUS Data Recovery would figure the rest. EaseUS Data Recovery Wizard bears the ‘Wizard’ title for a reason, it does every job in three single steps. First, launch the program and in the preferred type of file selection window, uncheck all the boxes but Graphics. 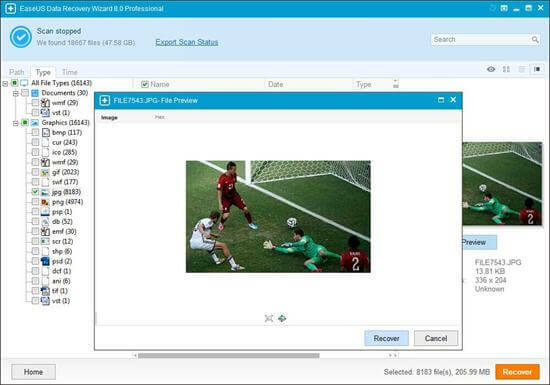 This will make Data Recovery Wizard recover photos in the hard drive and ignore all other file types. The rest of the process is similar to the process mentioned above for RAID recovery. Regardless of the storage media type, the process is same for all types of data storage media. EaseUS programs provide easier access to resource intensive tasks like RAID recovery. Following the guidance, anyone would be able to recover their RAID arrays at ease.